Anon. sale, Paris, Drouot, 18 March 1964, lot 41. Geneva, Musée d'Art et d'Histoire, Art Vénitien en Suisse et au Liechtenstein, 1978, no. 135. Udine, Castello d'Udine, Giandomenico Tiepolo, Maestria e gioco, 1996, and Bloomington, Indiana University Art Museum, 1997, no. 77. At least two other drawings of the same subject by Domenico are known. Another treatment of the subject, likewise horizontal but lacking washes, is in Stuttgart, J. Byam Shaw, The Drawings of Domenico Tiepolo, London, 1962, pl. 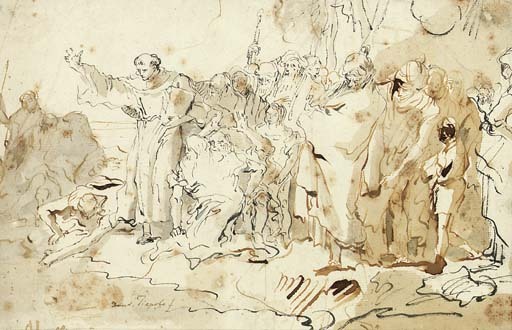 16, and a pen and ink with wash study of similar format, but with a slightly different composition was offered at Sotheby's London, 15 June 1983, lot 106. Dated to 1755-60, the present composition was executed first in pen and black ink and was expanded on either side by Domenico in pen and brown ink at a later date. According to legend, Saint Anthony went to the seaside to preach to the fish when the people of Rimini would no longer listen to him. The eloquence of his sermon not only drew the townspeople to the beach, but brought the very fish to the surface, where he blessed them.